Hi guys, welcome to another entry in this awesome Dental Solutions Los Algodones blog. We often talk about what foods are bad for your teeth. And I feel that I have repeated myself several times, so this times I will turn this topic around. 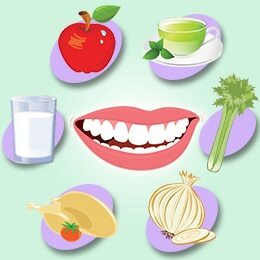 Let’s review what foods are the best for your dental hygiene. Which ones are really good for maintaining a white healthy smile. So keep reading so we can find out what should we eat more. First of all, to have a healthy body we need a healthy diet. This does not mean that you should go vegan or vegetarian. We need a balanced diet that incorporates every nutrient necessary to keep our body healthy. That means a diet that incorporates every group of food in their meals will get you the best results. Try to consume vegetables, fruits, carbs and protein in your day so the results can show in your smile. This is very important because many patients tend to avoid vegetables and fruits. Little do they know that these two are the best for your teeth as they contain natural cleansers that also help to clean your teeth real good. Apples, pears and carrots are especially good for this, also they are crazy tasty. But as I said before, you should also consume every group in the pyramid to get a perfect smile. The key word here is balance, because every food adds something important. Milk and other dairies are good for your teeth because they contain calcium. This makes all the bones in our body stronger and whiter. A glass of milk a day should be enough to achieve a really pretty smile and strong healthy teeth. However what you should avid is abusing sugar, oils and carbs, they on the other hand can ruin your teeth if you consume them in excess. Liquids are really important for our body to function well, and our mouth is not an exception. Our body is roughly 80% water and that is why drinking it is so important. 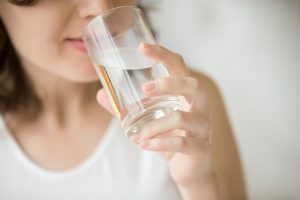 Doctors recommend drinking 6 to 8 glass es of water a day and this habit can help your smile more than you think. Drinking enough water will ensure that you mouth will produce saliva. Saliva plays a huge role in our dental hygiene as it keeps the mouth moist and nice. Besides, saliva contains nutrients that protect our teeth from germs and bacteria. If you want healthy teeth, water will help you scare away any dental disease. Another pro from drinking water and producing saliva is that it will make your teeth more resilient to stain. In the end, it does not matter how well you eat if you do not have a dental hygiene routine. Remember to always brush your teeth after every meal and use dental floss afterward to get rid of the food debris. Maintaining your teeth clean is key to keep them healthy and rinsing with mouthwash will help you with that too. Also, do not forget to visit your dentists at least 2 times a year for cleaning, we have our doors open for you at Dental Solutions in Los Algodones Mexico.